Standard of care in the treatment of acute Eichenholtz stage I Charcot neuroarthropathy includes complete non-weight bearing immobilized with total contact casting. This small case series of three patients focuses on patients with acute phase midfoot Charcot neuroarthropathy treated with non-casting immobilization therapy. All patients were male with a mean age of 48.7 (range 46-53) years. Patients were instructed to assume complete non-weight bearing during treatment. Due to financial restrictions, all patients reported fully weight bearing in the non-removable immobilization boot because of work related obligations. Immobilization therapy lasted a mean duration of 90.3 days (range 76 – 133 days) and was discontinued once there was clinical resolution of inflammation and osseous stability. Serial radiographs revealed absence of deformity progression and eventual consolidation in all cases. All patients remained ulcer and callus free during immobilization therapy, without progression of a rocker-bottom deformity, while fully weight bearing and maintaining full-time manual labor employment. This preliminary case series adds to the evidence base that it may be possible to allow protected weight bearing during acute phase Charcot neuroarthropathy with adequate immobilization of the foot at all times. Key words: Diabetes, Charcot neuroarthropathy, Foot Deformity, Casting, Foot fractures, Diabetic Foot. Charcot neuroarthropathy is an increasingly common clinical entity encountered by foot and ankle professionals. In the early decades of the last century syphilis was the most commonly associated etiology. That has changed with the advent of insulin and the resulting extended survival of patients suffering from diabetes mellitus. Although weight bearing during stage I of Charcot neuroarthropathy is controversial, many patients tend to be non-compliant. This is because this period of prolonged non-weight bearing may be detrimental in quality of life and may pose to be an unacceptable disability. [32,33] While the alternative may be amputation, advances in immobilization technology may allow protected weight bearing during the early stages of Charcot without the development of severe deformity. [34,35] The purpose of this study was to report results of acute Stage 1 Charcot neuroarthropathy in individuals immobilized in a vacuum stabilization boot that maintained full weight bearing. Three consecutive patients presented with acute Stage I Charcot neuroarthropathy over a three month period (November 2009 to January 2010). All three patients had Brodsky type I deformity involving the tarsometatarsal and naviculocuneiform joints. Patients were referred for examination and treated within two weeks of symptom onset. Clinical examination revealed erythema, warmth, and edema involving the midfoot with gross instability, crepitation with midfoot range of motion, and bounding pedal pulses. One patient had diabetic neuropathy while the other two were diagnosed with alcoholic neuropathy. Peripheral neuropathy was confirmed by the absence to detect the Semmes-Weinstein 10gm monofilament. Two of the three patients reported a minor injury preceding the Charcot event. The third patient had had previous amputations of digits two and three for localized osteomyelitis secondary to contiguous digital ulcerations. All three patients were male with a mean age of 48.7 (range 46-53) years. All patients presented within two weeks of first symptoms and were ulcer free at the time of initial presentation with this being their first occurrence of Charcot neuroarthropathy. Radiographs were obtained with findings consistent with early signs of Charcot neuroarthropathy. (Fig. 1A and 1B) Magnetic resonance (MR) imaging further confirmed the diagnosis with diffuse bone marrow edema adjacent to the Lisfranc joint. Figure 1A and 1B Initial anterior posterior (AP) (A) and lateral (B) radiographs demonstrating soft tissue edema with early signs of osteolysis, cortical thickening, fragmentation, and osseous destruction within the tarsometatarsal and naviculocuneiform joints. 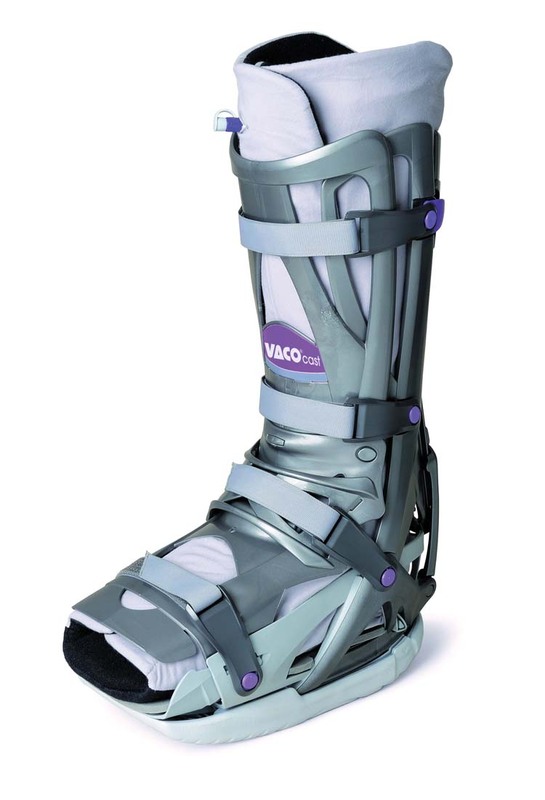 All three patients were treated with immobilization in a vacuum stabilization boot (VACOcast®, OPED Inc, Framingham, MA) with instructions to remain strictly non-weight bearing. (Fig. 2) Despite these recommendations, all three patients reported bearing weight on the affected limb in order to prevent loss of their job. All three patients were sole providers in their household with jobs that required extensive manual labor. The patients were compliant in wearing the boot at all times as this was verified through inspecting the undamaged compliance locks on the boot. Figure 2 In this boot, by removing air from a vacuum cushion, small beads contour around the lower limb and create vacuum stabilization. Serial monitoring was conducted by clinical examinations and plain radiographs. Patients were kept immobilized in the vacuum stabilization boot until resolution of edema, warmth (examined by palpation with back of hand and fingers and comparing to contra-lateral limb), and clinical stability was achieved. Successive radiographs were taken to ensure the absence of deformity progression every 3-4 weeks. (Fig. 3A, 3B and 3C) Throughout the treatment period each patient maintained normal full weight bearing in the conduct of their full-time jobs. Figure 3A, 3B and 3C Progression of acute phase of Charcot neuroarthropathy. AP (A), Oblique (B) and lateral (C) views demonstrate increased osseous destruction and osteolysis. Patients wore the vacuum stabilization boot for a mean of 90.3 days (range 76 – 133 days). One patient developed a superficial abrasion on the dorsal proximal interphalangeal joint of the second digit. This healed after two weeks of wound care and the additional of padding to the boot in this area. There were no other complications experienced. During the treatment of acute Stage I Charcot neuroarthropathy, all three patients remained ulcer and callus free while ambulating in the immobilization boot. Once the Charcot events had progressed to the consolidation phase, patients were transitioned to accommodative shoes or boots with supportive inserts. Two of the three patients were compliant with accommodative shoes and molded insoles. After 16 months from the initial presentation, both patients have not developed ulcers, callus, or progression of deformity. (Fig. 4A, 4B and 4C) During the 12 weeks that the third patient was wearing the immobilization boot, the deformity did not progress and the patient remained ulcer and callus free. Figure 4A, 4B and 4C AP (A), Oblique (B) and lateral (C) views showing progression into chronic Charcot neuroarthropathy with maintenance of anatomic alignment with consolidation of osseous destruction. However, the third patient did not obtain prescribed accommodative shoes or inserts citing financial limitations. He was subsequently lost to follow-up for five months after completing 12 weeks of immobilization therapy. His Charcot neuroarthropathy had developed a rocker bottom foot deformity and plantar midfoot ulcer after five months of interrupting care. Management of Charcot neuroarthropathy is a complex process which requires flexibility and constant attention. This small case series demonstrates that despite the overt disregard for non-weight bearing management instructions, all patients were able to maintain employment and prevent progression of rocker bottom midfoot deformities during acute Eichenholtz stage I Charcot neuroarthropathy as there was continuous utilization of the vacuum immobilization boot. Patients were continuously immobilized in a vacuum stabilizing below-knee boot with compliance confirmed by boot locks. There were minimal complications during the acute phase treatment with one patient developing a superficial digital abrasion from the boot. This was identified immediately and rectified by adjusting the boot. Despite fully weight-bearing, a rocker bottom deformity was prevented with adequate and constant immobilization. The immobilization boot reported in this study was chosen for several reasons. Total contact casts require frequent changes and proper construction to prevent complications related to this casting technique. This immobilization boot had the advantage of clinical efficiency as no time was necessary beyond properly sizing and fitting the patient and providing instructions on its use. The vacuum boot can be adjusted to accommodate changes in edema. The removable sole allows patients to sleep with the boot without dirtying the linens. It also has a radiolucent frame that permits radiographic evaluation without removal. Finally, the compliance locking straps prevent unknown patient removal. Although none of the affected limbs had an open ulcer necessitating daily care, had local wound care been necessary by a visiting nurse an additional key would have been provided. Limitations of this study include its retrospective nature. The initial treatment plan did not permit patients to weight bear during acute phase Charcot neuroarthropathy, however, weight bearing did not adversely impact the treatment outcome. Both mechanical and comparative studies are needed to further investigate the ability of nontraditional immobilization devices to effectively prevent osseous deformity in a disease which can cause permanent disability and eventual amputation. Future prospective studies with a larger sample size are needed to assess the long-term outcomes of this immobilization technique. Comparison studies of different immobilization techniques would also be very useful. Finally, the definition of adequate immobilization needs further investigation in order to achieve a balance of prevention of serious Charcot-related complications and quality of life. Patients with acute Eichenholtz stage I midfoot Charcot neuroarthropathy were able to fully weight bear and maintain manual labor employment without development of a rocker bottom foot deformity while wearing a vacuum stabilization below-knee boot. Advances in immobilization therapy may allow improvement in the quality of life in acute phase Charcot neuroarthropathy. 1. Holewski, J, Moss KM, Stess RM, Graf PM, Grunfeld C. Prevalence of foot pathology and lower extremity complications in a diabetic outpatient clinic. J Rehab Res and Devel 1989 26: 35-44. 2. Sohn MW, Stuck RM, Pinzur M, Lee TA, Budiman-Mak E. Lower-extremity amputation risk after charcot arthropathy and diabetic foot ulcer. Diabetes Care 2010 33: 98-100. 3. van der Ven A, Chapman CB, Bowker JH. Charcot neuroarthropathy of the foot and ankle. J Am Acad Orthop Surg 2009 17: 562-571. 4. Sohn MW, Lee TA, Stuck RM, Frykberg RG, Budiman-Mak E. Mortality risk of Charcot arthropathy compared with that of diabetic foot ulcer and diabetes alone. Diabetes Care 2009 32: 816-821. 5. Boulton AJ, Jeffcoate WJ, Jones TL, Ulbrecht JS. International collaborative research on Charcot’s disease. Lancet 2009 J373 (9658): 105-106. 6. Shibuya N, La Fontaine J, Frania SJ. Alcohol-induced neuroarthropathy in the foot: a case series and review of literature. 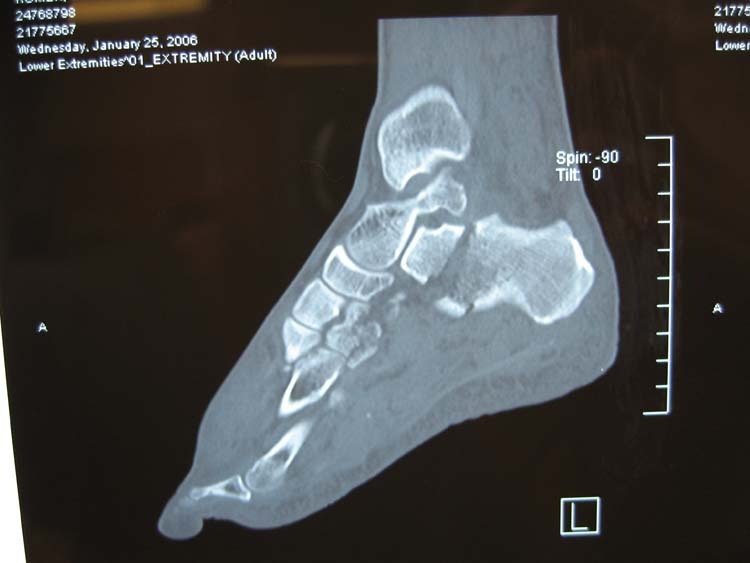 J Foot Ankle Surg 2008 47: 118-124. 7. Nielson DL, Armstrong DG. The natural history of Charcot’s neuroarthropathy. Clin Podiatr Med Surg 2008 1: 53-62. 8. Frykberg RG, Belczyk R. Epidemiology of the Charcot foot. Clin Podiatr Med Surg 2008 1:17-28. 9. Pinzur MS. Current concepts review: Charcot arthropathy of the foot and ankle. Foot Ankle Int 2007 8: 952-959. 10. Sanders LJ. What lessons can history teach us about the Charcot foot? Clin Podiatr Med Surg 2008 1: 1-15. 11. Wukich DK, Sung W. Charcot arthropathy of the foot and ankle: modern concepts and management review. J Diabetes Complications 2009 23: 409-426. 12. Jeffcoate WJ. Charcot neuro-osteoarthropathy. Diabetes Metab Res Rev 2008 24 (Suppl 1): S62-65. 13. Petrova NL, Edmonds ME. Charcot neuro-osteoarthropathy-current standards. Diabetes Metab Res Rev 2008 24 (Suppl 1): S58-61. 14. Chantelau E. The perils of procrastination: effects of early vs. delayed and treatment of incipient Charcot fracture. Diabet Med 2005 22: 1707–1712. 15. Eichenholtz SN. Charcot Joints. Springfield, Illinois: Charles C. Thomas, 1966. 16. Shaw JE, His WL, Ulbrecht JS. The mechanism of plantar unloading in total contact casts: implications for design and clinical use. Foot Ankle Int 1997 18: 809-817. 17. Pinzur MS, Shields N, Trepman E, Dawson P, Evans A. Current practice patterns in the treatment of Charcot foot. Foot Ankle Int 2000 21: 916–920. 18. Brodsky JW. The diabetic foot. In: Coughlin MJ, Mann RA, editors. Surgery of the Foot and Ankle. Vol 2. 7th ed. St. Louis, Mosby. 1999, 895-969. 19. Pinzur MS, Shields N, Trepman E, Dawson P, Evans A. Current practice Patterns in the treatment of Charcot foot. Foot Ankle Int 2000 21: 916-920. 20. Armstrong DG, Todd WF, Lavery LA, Harkless LB, Bushman TR. The natural history of acute Charcot’s arthropathy in a diabetic foot specialty clinic. Diabetic Med 1997 14: 357-363. 21. Molines L, Darmon P, Raccah D. Charcot’s foot: newest findings on its pathophysiology, diagnosis and treatment. Diabetes Metab 2010 36: 251-255. 22. Pinzur, MS. Surgical vs. accommodative treatment for Charcot arthropathy of the midfoot. Foot Ankle Int 2005 25: 545-549. 23. Myerson MS, Henderson MR, Saxby T, Short KW. Management of midfoot diabetic neuroarthropathy. Foot Ankle Int. 1994 15: 233-241. 24. Alpert SW, Koval KJ, Zuckerman JD. Neuropathic arthropathy: review of current knowledge. J Am Acad Orthop Surg. 1996 4: 100-108. 25. Fabrin J, Larsen K, Holstein PE. Long-term follow-up in diabetic Charcot feet with spontaneous onset. Diabetes Care 2000 23: 796-800. 26. Schon LC, Easley ME, Weinfeld SB. Charcot neuropathy of the foot and ankle. Clin Orthop Relat Res 1998 349: 116-131. 27. Wukich DK, Motko J. Safety of total contact casting in high-risk patients with neuropathic foot ulcers. Foot Ankle Int 2004 25: 556-560. 28. Pinzur MS, Lio T, Posner M. Treatment of Eichenholtz stage I Charcot foot arthropathy with a weightbearing total contact cast. Foot Ankle Int 2006 27: 324-329. 29. de Souza LJ. Charcot arthropathy and immobilization in a weight-bearing total contact cast. JBJS 2008 90A:754-759. 30. Kimmerle R, Chantelau E. Weight-bearing intensity produces charcot deformity in injured neuropathic feet in diabetes. Exp Clin Endocrinol Diabetes 2007 115: 360-364. 31. Chantelau E, Kimmerle R, Poll LW. Nonoperative treatment of neuro-osteoarthropathy of the foot: do we need new criteria? Clin Podiatr Med Surg 2007 24: 483-503. 32. Pakarinen TK, Laine HJ, Mäenpää H, Mattila P, Lahtela J. Long-term outcome and quality of life in patients with Charcot foot. Foot Ankle Surg 2009 15: 187-191. 33. Sochocki MP, Verity S, Atherton PJ, Huntington JL, Sloan JA, Embil JM, Trepman E. Health related quality of life in patients with Charcot arthropathy of the foot and ankle. Foot Ankle Surg 2008 14: 11-15. 34. Verity S, Sochocki M, Embil JM, Trepman E. Treatment of Charcot foot and ankle with a prefabricated removable walker brace and custom insole. Foot Ankle Surg 2008 14: 26-31. 35. Stöckle U, König B, Tempka A, Südkamp NP. Cast immobilization or vacuum stabilizing system? Early functional results after osteosynthesis of ankle fractures. Unfallchirurg 2000 103: 215-219. Address correspondence to: Harvard Medical School, Beth Israel Deaconess Medical Center, Boston, MA. 1,2 Clinical Instructors in Surgery at Harvard Medical School, Division of Podiatric Surgery, Department of Surgery. Introduction: The purpose of this study was to assess radiograph incidence versus cadaver incidence rates of the os perineum (OP) within the fibularis (peroneus) longus tendon (FLT) and to assess why broad variants have occurred in previous radiograph and cadaver studies. The OP or sesamoid bone in the FLT has a history of controversy regarding the terminology and frequency. 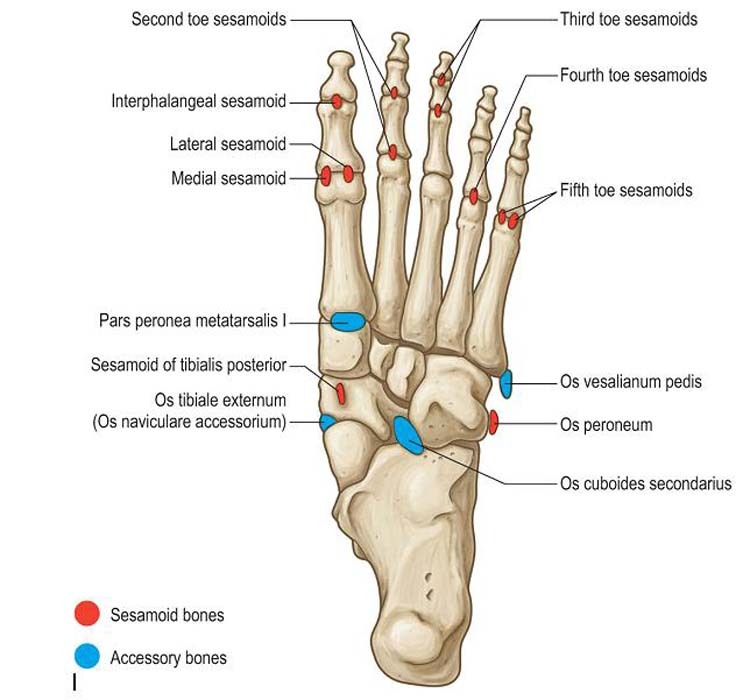 Recent histological studies have proven sesamoid terminology. Cadaver studies have revealed high incidence rates (IR), yet virtually all texts and atlases exclude it. Clinicians recognize it in routine foot radiographs. No studies have compared IRs between cadavers and injured patients of the general population. Methods: A literature search of texts, atlases, journals and websites was conducted identifying incidence of OP within the FLT. Dissection of 82 embalmed cadavers (M 52, F 30) identified the IR of the OP. Oblique foot radiographs from 1,025 individuals were examined. Results: A literature review revealed OP in 20% of atlases, 7.69% in texts, and previous cadaver study results are 46%, 90%, and 14.9%. This study’s cadaver results reported an IR of 88.46% with an average age of 78.1 (45 – 89yrs). Radiographic results revealed 15.12% incidence with an average age 41.97 (10 – 89yrs). The average IR from 10 to 70 years was 13.32%. From 70 onwards it increased to 32.98%. The p value per decade from radiographic analysis was 0.0005. Conclusion: This study suggests there is a high IR of an OP in cadavers (88.46%). This may be a result of the average age of cadavers 78.1 and the technique used to locate the OP. Radiographic results were significantly lower and may be explained by an age factor. Radiographs reviewed were from an emergency room where the majority of patients receiving foot radiographs were between the ages of 19 – 45. The clinical importance has been understated regarding the area of the os peroneum, which can be mistaken for styloid and Jones’ fractures. Key words: Os peroneum, incidence, foot injury, sesamoid bone, Jones fracture, styloid process. The purpose of this study was to examine the important clinical relevance of the ‘os peroneum’ (OP) within the fibularis longus (FLT) by investigating the incidence of the OP between cadaveric specimens and radiological images. 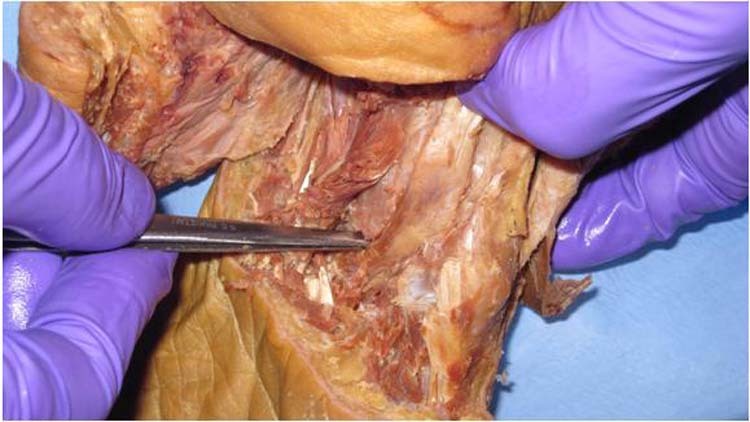 The ‘os peroneum’ within the fibularis (peroneus) longus tendon has a history of controversy regarding its incidence in both individual and combined radiographic and cadaver studies. Radiographic and cadaveric studies have reported incidence rates of the OP within the FLT, however, a limited number of anatomical textbooks and atlases used by healthcare professionals and trainees mention or illustrate the OP. At the styloid process a horizontal incision was made along the surface of the foot to the opposite side, then exposing the FLT within the tunnel it traverses. The FLT was freed from its attachment point distally and reflected back. Palpation of the FLT was performed to identify the OP. A longitudinal incision was performed 2cm proximal and distal to the OP and then opened to reveal the ‘sesamoid bone’s’ existence or not. (Fig. 4B) A second examiner palpated and analyzed the longitudinal incision and reported their findings. A paired t-test was conducted on the radiographic data. Figure 4A and 4B OP within the FLT in a cadaver. 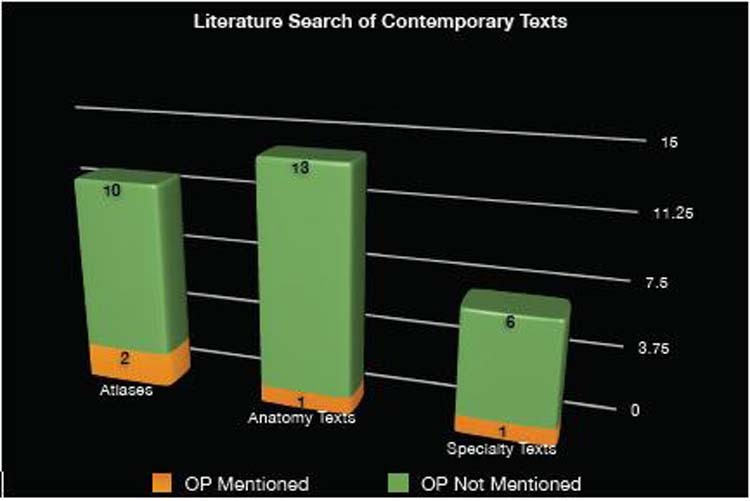 The literature search revealed the OP within the FLT was discussed in anatomy texts (7.69%), contemporary atlases (20%) and specific imaging texts (16.6%). This study’s radiographic evaluation of OP within the FLT from 1,025 individuals with a mean age of 41.97 years had an incidence rate of 15.12% overall. Incidence by ten-year increments revealed 12.16% for 10-19 years, 11.31% for 20-29 years, 13.87% for 30-39 years, 16.17% for 40-49 years, 15.15% for 50-59 years, 10% for 60-69 years, 41.38% for 70-79 years, and 19.44% for 80-89 years. The number of radiographs analyzed per ten-year increment was from approximately 100 individuals. (Graphs 1 and 2) The p value for the radiographic images was 0.0005. In this study, the incidence rate of the cadaver dissections was 88.46% with a mean age of 78.1. Graph 1 Radiographic incidence of the OP within the FLT per ten-year increment. Graph 2 Identification of the OP within the FLT in educational texts. The etiology of the OP is unknown; however, it has been thought that it arises from both mechanical and genetic factors. [7,11] A literature search of contemporary anatomical texts, atlases and specialty radiographic texts revealed incidence rates of 7.69%, 20% and 16.6%, respectively. This lack of recognition of the OP in commonly used texts and atlases contradicts radiographic and cadaver evidence from our study. Our study’s incidence rate of identifying the OP within the FLT from radiographs (15.12%) was consistent with other radiographic studies. (Table 1). Radiographic studies report incidence rates of 31.8%, 4.7%, 14%, 14% and 9%. [3,4,1,11,13] The reason the incidence of the OP within the FLT in the images of our study was less than cadaveric results may be due to the average age of the individuals from the radiographs (41.97 years). Table 1 Review of OP within the FLT in radiographic and cadaveric studies. 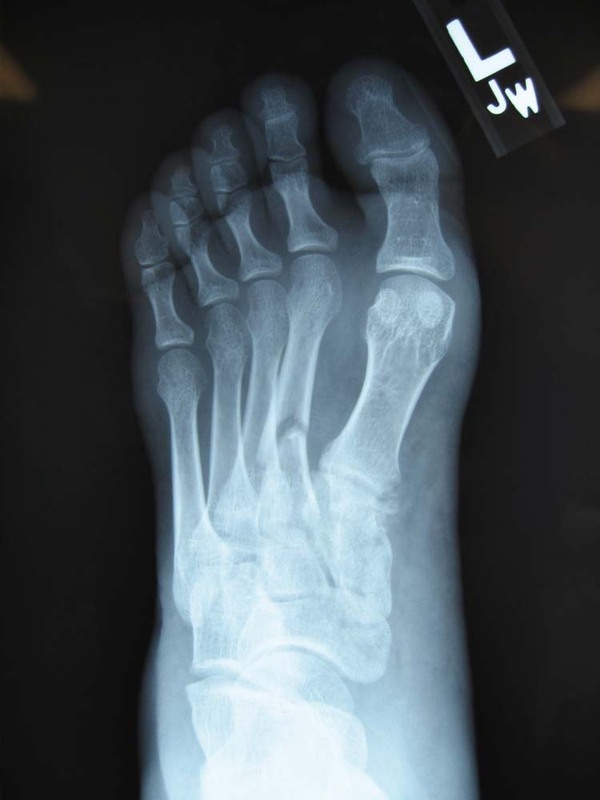 The radiographs reviewed were from an emergency room where on average the majority of patients receiving foot radiographs are between the ages of 19-61. The incidence rate might have been higher if the average age of the individuals was higher. Another study had a mean age of 51 years. Two other studies only provided the range of their subjects and none were greater than 72 years. [3,4] Two other radiographic studies did not provide any information on the mean age or range. [1,13] To collect comprehensive research on the radiographic incidence of the OP within the FLT, further data is required in the age range of 60 and up. The method of identification may also contribute to the high incidence rate of the OP within the FLT because our study palpated and dissected open the OP, but did not use histology or radiology to confirm presence of OP from cadavers. A possible factor affecting the radiographic results of our study is that we used only those patients who presented to the emergency room with foot pain. It is not common for people over age 60 to present to the emergency room with sprained ankles or fractured 5th metatarsals. The over 60 age group population present acutely with hip fractures or with gout of the great toe. There may have been different results if we had randomly chosen from the general population for OP in the FLT. The clinical importance has been understated regarding the area of the os peroneum, which can be mistaken for styloid and Jones’ fractures. 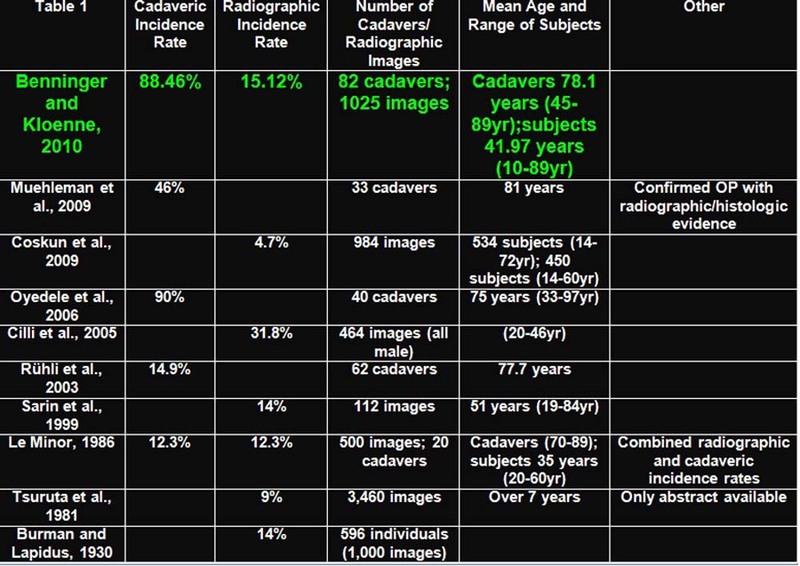 The radiograph IR was always over 10% regardless the age group while the cadaveric incidence rate was 88.46%. This suggests that teaching the OP in the FLT is clinically relevant because lower limb injuries are common. 1. Burman MS, Lapidus PW. The functional disturbance caused by the inconstant bone and sesamoids of the foot. Arch Surg 1931 22: 936. 2. Carter DR, Orr TE, Fyhrie DP, Schurman DJ. Influences of mechanical stress on prenatal and postnatal skeletal development. Clin Orthop Relat Res 1987 219: 237-250. 3. Cilli F, Akcaoglu M. The incidence of accessory bones of the foot and their clinical significance. Acta Orthop Traumatol Turc 2005 39: 243-246. 4. Coskun N, Yuksel M, Cevener M, Arican RY, Ozdemir H, Bircan O, Sindel T, Ilgi S, Sindel M. Incidence of accessory ossicles and sesamoid bones in the feet: a radiographic study of Turkish subjects. Surg Radiol Anat 2009 31: 19-24. 5. Le Minor JM. Comparative anatomy and significance of the sesamoid bone of the peroneus longus muscle (os peroneum). J Anat 1987 151: 85-99. 6. Mellado JM, Ramos A, Salvadó E, Camins A, Danús M, Saurí A. Accessory ossicles and sesamoid bones of the ankle and foot: imaging findings, clinical significance and differential diagnosis. Eur Radiol 2003 13: L164-L177. 7. Muehleman C, Williams J, Bareither ML. A radiologic and histologic study of the os peroneum: prevalence, morphology, and relationship to degenerative joint disease of the foot and ankle in a cadaveric sample. Clin Anat 2009 22: 747-754. 8. Oydele O, Maseko C, Mkasi N, Mashanyana M. High incidence of the os peroneum in a cadaver sample in Johannesburg, South Africa: possible clinical implication? Clin Anat 2006 19: 605-610. 9. Reason for Visits to Emergency Room – National Hospital Ambulatory Medical Care Survey 1998-2006. U.S. Department of Health and Human Services; Centers for Disease Control and Prevention; National Center for Health Statistics. 10. Rühli FJ, Solomon LB, Henneberg M. High prevalence of tarsal coalitions and tarsal joint variants in recent cadavers sample and its possible significance. Clin Anat 2003 16: 411-415. 11. Sarin VK, Erickson GM, Giori NJ, Bergman AG, Carter DR. Coincident development of sesamoid bones and clues to their evolution. Anat Rec 1999 257: 174-180. 12. Stranding, S. Gray’s Anatomy: The Anatomical Basis of Clinical Practice, 40th ed. Philadelphia: Elsevier 2005, pg 1420. 13. Tsuruta T, Shiokawa Y, Kato A, Matsumoto T, Yamazoe Y, Oike T, Sugiyama T, Saito M. Radiological study of the accessory skeletal elements in the foot and ankle (abstract). J Jap Orthop Assoc 1981 55: 357-370. 611 SW Campus Drive, Portland, OR 97239. 1 Department of Surgery, Department of Integrative Biosciences, Department of Orthopaedic Surgery & Rehabilitation, Department of Oral Maxillofacial Surgery, Oregon Health & Science University, Portland, OR. 2 Department of Integrative Biosciences, Oregon Health & Science University, Portland, OR. For several years, there has been much controversy over the optimal form of fixation in the operative treatment of Lisfranc injuries. Both cortical and cannulated screws have been widely used in the treatment of these injuries. The level of technical difficulty and reproducible accuracy of the cannulated screw system has gained much popularity. In comparison, the rigid stability of cortical screws appears more favorable. The authors present a cannulated technique utilizing a single 4.0 mm cortical screw (Synthes USA Paoli, Pa.). In Lisfranc injuries with partial incongruity, this method allows precise screw placement while maintaining rigid solid screw stabilization. The technique is minimally invasive, provides anatomical restoration and allows early return to functional activity. Key Words: Lisfranc injury, midfoot fracture, cannulated screw, foot sprain, dislocation. Types C1 and C2 injuries result in partial or total displacement respectfully. Such classification systems allow communication between surgeons, but offer no prognostic value. The authors share their surgical technique for addressing partial incongruous Lisfranc injuries; lateral displacement injuries affecting only the second metatarsal. The technique is also useful for patients with a symptomatic subtle diastasis. This technique allows direct visualization of the injury, anatomical reduction, articular cartilage preservation, and rigid solid screw stabilization. The technique is avoided in patients with neuropathic arthropathy, peripheral vascular disease, insensate feet, open physis, complex dislocations, and open fracture dislocations. Patients with partially incongruent Lisfranc injuries (B2) were treated with internal fixation utilizing 4.0 mm solid screw (Synthes®, Paoli, Pa. USA). 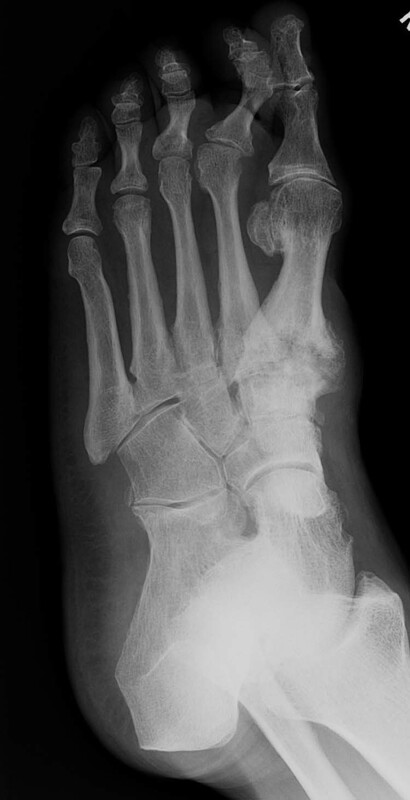 Figure 1 Bilateral comparison weightbearing anteroposterior radiographs demonstrating partial incongruity of the second tarsometatarsal joint. Note the arrow identifying the first and second metatarsal base diastasis. 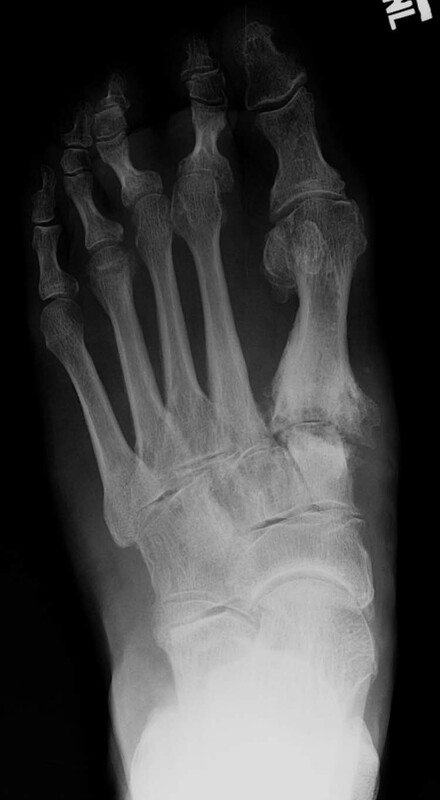 Figure 2 Oblique foot radiograph. 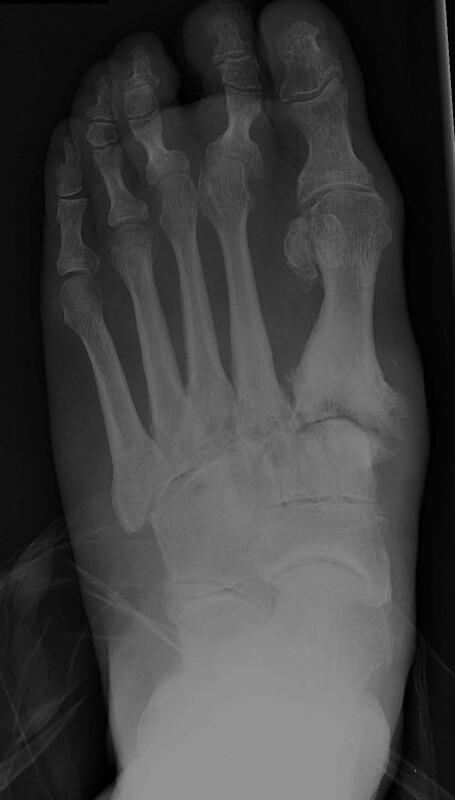 Note the collinear relationship at the adjacent tarsometatarsal joints. The neurovascular bundle is identified by palpating the dorsalis pedis artery prior to inflation of the calf tourniquet. The interval between the first and second metatarsal bases is verified under fluoroscopy. (Fig. 3) A single 6cm longitudinal skin incision is made medial to the neurovascular bundle. 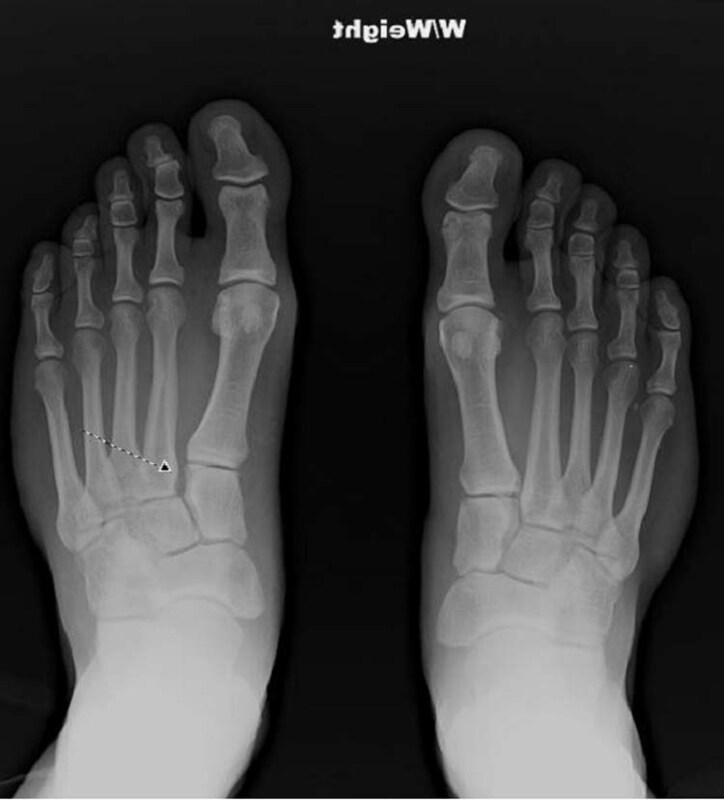 Figure 3 Freer elevator used prior to guide incision placement to identify the interval between the first and second metatarsal cuneiforms. 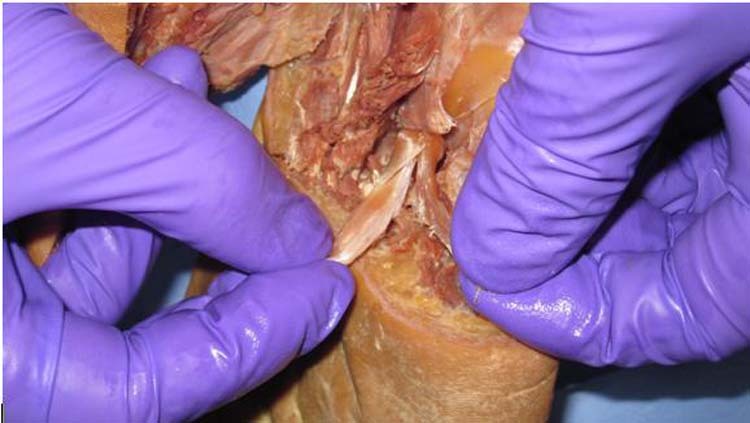 Blunt dissection is continued down to the level of the extensor hallucis brevis muscle tendon (EHB). The EHB tendon is retracted laterally. Subperiosteal dissection at the intercuneiform level is extended just distal to the first and second metatarsal base articulation. The Lisfranc ligament integrity is evaluated. A ruptured Lisfranc ligament, fibrotic tissue and or bone fragments can impede anatomical reduction and must be debrided and or excised. Care is taken to protect the neurovascular bundle and deep plantar artery. Reduction is performed by placing a bone tenaculum around the medial cuneiform and second metatarsal base. The second metatarsal is reduced to the medial border of the middle cuneiform. The reduction is verified under fluoroscopy. (Fig. 4) If a diastasis remains present, first and second metatarsal base interval is inspected and the bone reduction tenaculum is adjusted. Once reduction of the diastasis is achieved, a 1.2 mm guide wire is obtained from the cannulated 3.5/4.0mm Synthes screw set. Figure 4 A bone tenaculum is utilized to reduce the first and second metatarsal base diastasis. Figure 5 The 1.2 mm guide wire is placed from medial to lateral just penetrating the second metatarsal base lateral cortex. The knee is then flexed and the guide wire position is verified under fluoroscopy on both an anteroposterior and lateral projection. The medial cuneiform is then countersunk to prevent screw irritation. Next, the cannulated depth gauge is used to determine the screw length. The 1.2mm guide wire is advanced until it exits the foot dorsolaterally. (Fig. 6A and 6B). By exiting the foot in this fashion, it allows easy retrieval of the guide wire if breakage occurs. The cannulated 2.5 mm drill bit is utilized to drill over the guide wire and penetrates the lateral second metatarsal base cortex. (Fig. 7) The appropriate length 4.0 mm screw is obtained and inserted in line with the guide wire. (Fig. 8A and 8B) To prevent toggle or misdirection during insertion, the guide wire is removed simultaneously. 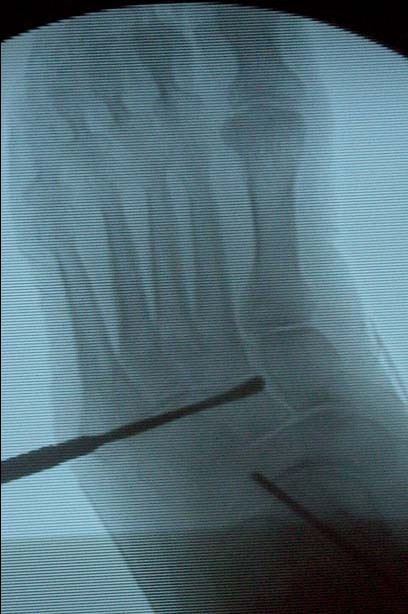 Figure 7 The 2.5 mm cannulated drill is used to drill over the 1.2mm guide wire penetrating the lateral 2nd metatarsal base cortex. The bone reduction tenaculum is disengaged and removed. Screw placement and stability are verified under fluoroscopy. (Fig. 9) The calf tourniquet is deflated and hemostasis achieved prior to closure. Figure 9 Intraoperative anteroposterior image demonstrating diastasis reduction and 4.0mm solid screw fixation. Postoperatively, patients are placed into a Jones compression dressing with a posterior splint for until postoperative day seven. The patient is then transferred into a short leg non-weightbearing cast for 14 days. At day 21 the sutures are removed and another short leg cast is applied. Patients are non-weightbearing for a further 6 weeks, followed by protected weight bearing in a walking boot with progression to normal shoe gear as tolerated. 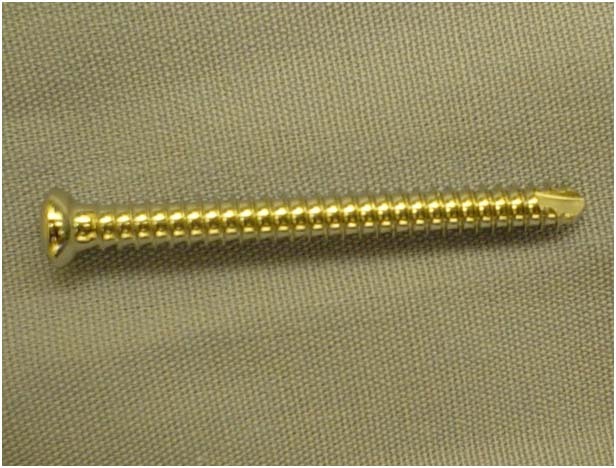 The cannulated solid screw technique is an alternative treatment option for partial incongruous injuries or subtle dislocations. Excessive fixation is avoided while preserving articular congruity. The rigidity of the 4.0 mm solid screw allows early functional rehabilitation. Retrospectively, the authors have treated 10 patients using this technique with a zero incidence of hardware fatigue or breakage. In conclusion, our technique has proven to be effective for stabilizing partial incongruous Lisfranc injuries. The technique is reproducible, accurate and allows for early function rehabilitation. The rigidity of the 4.0 mm solid screw provides optimal stability. However, care must be taken to individualize this treatment based on the extent of tarsometatarsal joint displacement. 1. Buzzard BM, Manos, RE, Buoncristiani A, Mills WJ: Surgical management of acute tarsometatarsal fracture dislocation in the adult. Clin Orthop 353: 125 – 133, 1998. 2. Hardcastle PH, Reschauer R, Kutscha-Lissberg E, Schoffmann W: Injuries to the tarsometatarsal joint. Incidence, classification and treatment. J Bone and Joint Surg 64B (3): 349 – 356, 1982. 3. Quenu E, Kuss G: Etude sur les luxations du metatarse (luxations metatarso-tariennes). Rev Chir 39: 281 – 336, 1909. 4. Myerson MS, Fisher RT, Burgess AR, Kenzora JE. Fracture dislocations of the tarsometatarsal joints: end results correlated with pathology and treatment. Foot Ankle Clinics 6: 225 – 242, 1986. 5. 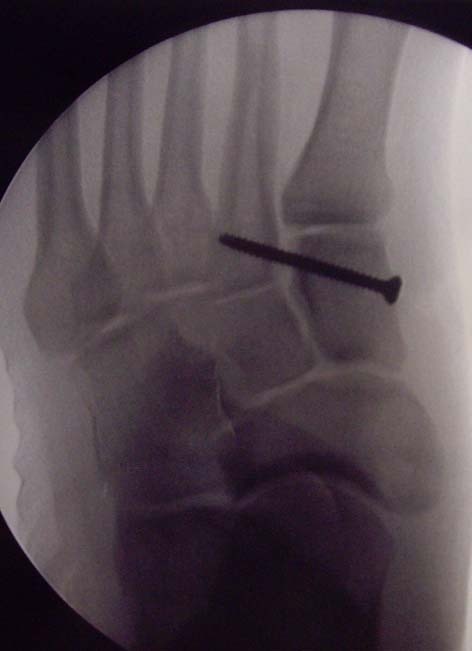 Thodarson DB, Hurwitz G: PLA screw fixation of Lisfranc Injuries. Foot Ankle Int 23: 1003 – 1007, 2002. 6. 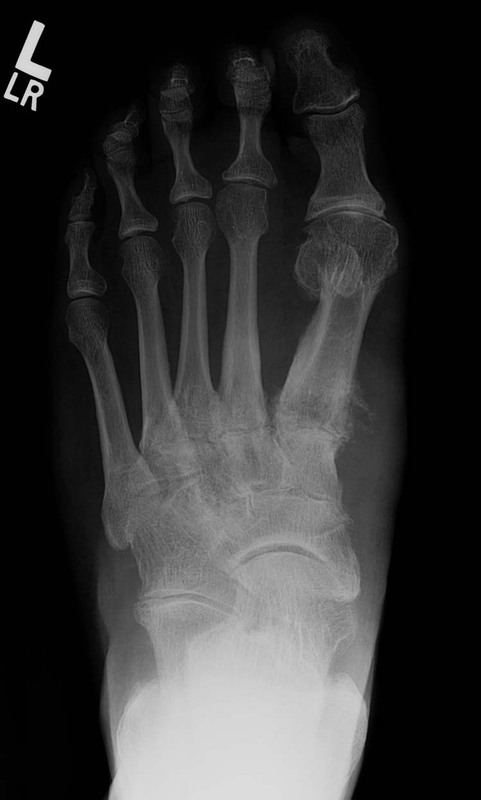 Myerson MS: The diagnosis and treatment of injury to the tarsometatarsal joint complex. J Bone Joint Surg 81B: 756 – 763, 1999. 7. Kuo R, Tejwani N, DiGiovanni CW, Holt SK, Benirschke SK, Hansen ST Jr, Sangeorzan BJ: Outcome after open reduction and internal fixation of Lisfranc joint injuries. J Bone Joint Surg 82A: 1609 – 1618, 2000. 8. Arntz CT, Hansen ST: Dislocations and fracture dislocations of the tarsometatarsal joints. Orthop Clin North Am 18: 105 – 114, 1987. 9. Bloome DM, Clanton TO: Treatment of Lisfranc injuries in the athlete. Tech. Foot Ankle Surg 1: 94 – 101, 2002. 10. Chiodo C, Myerson M: Developments and advances in the diagnosis and treatment of injuries to the tarsometatarsal joint. Orthop Clin North Am 32: 11 – 20, 2001. 11. Arntz CJ, Veith RG, Hansen Jr. ST: Fractures and fracture dislocations of the tarsometatarsal joints. J Bone Joint Surg 70A (2): 173 – 181, 1988. 12. Alberta FG, Aronow MS, Barrero M, Diaz-Doran V, Sullivan RJ, Adams DJ: Ligamentous Lisfranc joint injuries: A biomechanical comparison of dorsal plate and transarticular Screw Fixation. Foot Ankle Int 26: 462 – 473, 2005. 13. Coss HS, Manos RE, Buoncristiani A, Mills W: Abduction stress and AP weightbearing radiography of purely ligamentous injury in the tarsometatarsal joint. Foot Ankle Int 19: 537 – 541, 1998. 14. Goosens M, De Stoop N: Lisfranc’s fracture-dislocations: etiology, radiology, and results of treatment. Clin Orthop 176: 165 – 162, 1983. 15. Alberta FG, Aronow MS, Barrero M, Diaz-Doran V, Sullivan RJ, Adams DJ: Ligamentous Lisfranc joint injuries: a biomechanical comparison of dorsal plate and transarticular screw fixation. Foot Ankle Int. 26: 462 – 472, 2005. 16. Ly V, Coetzee JC: Treatment of primary ligamentous Lisfranc joint injuries: primary arthrodesis compared with open reduction and internal fixation. J Bone Joint Surg 88A: 514 – 520, 2006. 17. Davies MS, Saxby TS: Intercuneiform instability and the “gap sign”. Foot Ankle Int 20: 606 – 609, 1999. 18. Meyer SA, Callaghan JJ, Albright JP, Crowley ET, Powell JW: Midfoot sprains in collegiate football players. Am J Sports Medicine 22: 392-401, 1994. 19. Shapiro MS, Wascher DC, Finerman GA: Rupture of Lisfranc’s ligament in athletes. Am J Sports Med 22: 687 – 691, 1994. 1 Chief, Foot and Ankle Division, Department of Orthopaedic Surgery; University of Pittsburgh Medical Center, Pittsburgh, Pennsylvania. 2 3rd year resident, Department of Graduate Medical Education; University of Pittsburgh Medical Center Surgery, Pittsburgh, Pennsylvania. 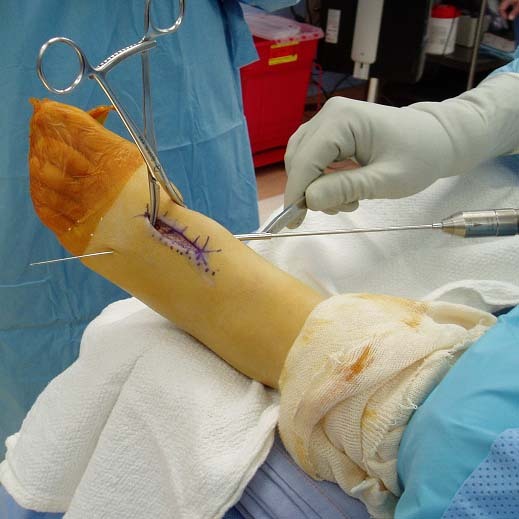 Compartment syndrome is a well known surgical emergency encountered by physicians on trauma call. When compounded by platelet dysfunction, the management of a compartment syndrome becomes exponentially more difficult for the surgeon. The following case describes a twenty-four year old male who sustained multiple comminuted tarsal and metatarsal fractures after a crush injury that was further complicated by an existing platelet dysfunction known as May-Hegglin anomaly (MHA). This article reviews May-Hegglin and other rare hematological conditions that often obscure otherwise straightforward surgical cases. May-Hegglin anomaly (MHA) is a familial disorder that is a rare type of autosomal dominant platelet disorder. From 2000-2005, only 85 families with MHA were reported. It is associated with thrombocytopenia with varying degrees of purpura, bleeding, giant platelets, and cytoplasmic inclusion bodies that resemble Döhle bodies in the granulocytes (neutrophils, eosinophils, monocytes). [4,6] In these patients, neutrophil and platelet function is considered to be normal. Thrombocytopenia occurs in almost all patients and severe bleeding is rare but has been reported. These patients have a mutation of the MYH9 gene, encoding non-muscle myosin heavy chain IIA, present in chromosomal region 22q12-13. [4,6] This mutation results in disordered production of non-muscle myosin heavy-chain type IIA. The result is macrothrombocytopenia, secondary to defective megakaryocyte maturation and fragmentation. Other associated syndromes are Sebastian, Fechtner, or Epstein syndromes. Differential diagnosis associated with thrombocytopenia and large platelets include Alport syndrome, Bernard-Soulier syndrome, Montreal platelet syndrome, immune thrombocytopenia, and gray-platelet syndrome. The differential diagnosis for leukocytic inclusions includes septicemia, myeloproliferative disorders, and pregnancy. A case report describes a twenty-four year old male who sustained multiple comminuted tarsal and metatarsal fractures after a crush injury that was further complicated by an existing platelet dysfunction known as May-Hegglin anomaly (MHA). Figure 1 Initial presentation after crush injury of the left foot. 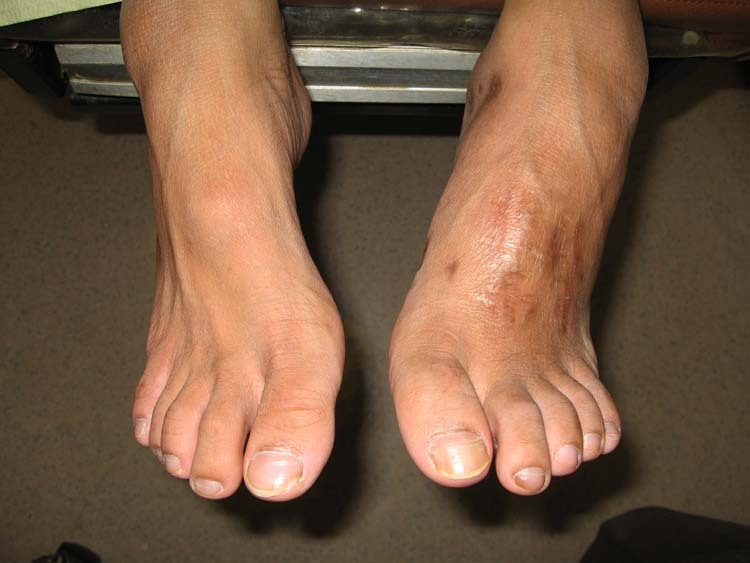 Initial evaluation in the trauma bay was significant for left foot swelling, pain, and mottled skin. His sensory function was compromised while gross motor function remained intact. He presented with stable vital signs. His past medical history was positive for the May-Hegglin anomaly. He reported living with his parents, denied allergies, and had an otherwise unremarkable review of systems. A full physical exam was normal with the exception of his left lower extremity. The lower extremity exam was positive for: diminished pulses, exquisite pain on palpation of the mid-foot area, pain with range of motion of digits 1,2,3 and 4, decreased temperature, color changes, and swelling. Arterial line pressure monitoring revealed compartment pressures between 75 mmHg and 100 mmHg in the foot, therefore the operating room was called and prepared for emergent surgery. 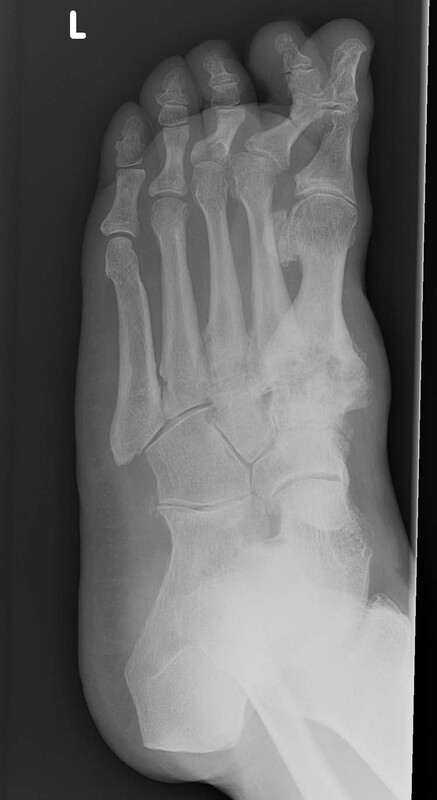 Figure 2 Radiograph reveals first and second metatarsal crush fracture. Figure 3 Sagittal CT view of crush injury. Displaced metatarsal, calcaneal, and cuneiform fractures are evident. Stat labs revealed the following abnormalities: WBC 4.9, HgB 8.6, HCT 25.9 and platelets were 39,000mm3. He was then typed and crossed for surgery. In the operating room, general anesthesia was administered and an emergent fasciotomy was preformed following typical sterile preparation. His left foot was noted to be severely cyanotic, mottled, and cool to touch. 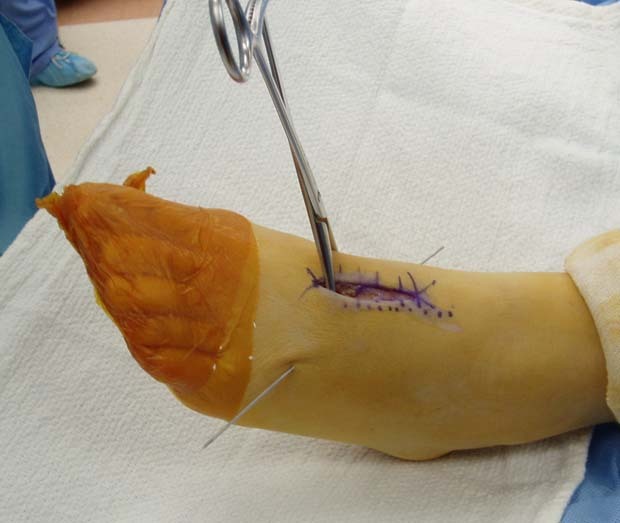 An 8-10 cm medial incision was made to the level of the deep fascia. 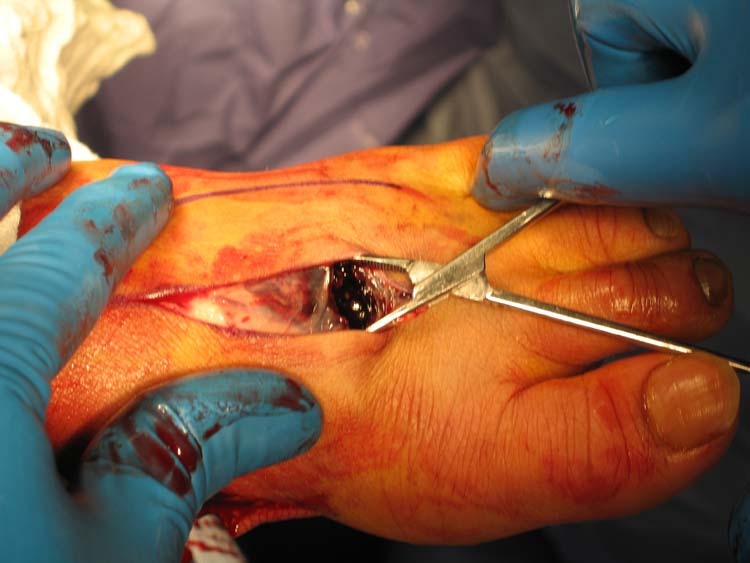 Figure 4 Surgical exploration shows dark, non-coagulated blood and hematoma associated with the compartment syndrome. 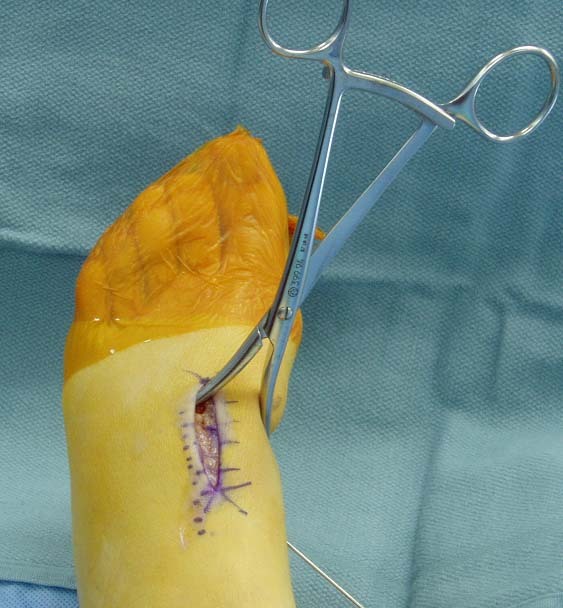 Both the medial and plantar compartments were explored through this incision. Approximately one to two minutes after initial incision was made, the hallux changed from a mottled, blanched, cyanotic color to a healthy pink hue with appropriate capillary refill time. A second incision was then made between the shafts of the second and third metatarsals. Blunt dissections in to the deep fascia revealed additional copious amounts of dark blood that was evacuated from the compartment. A third incision was placed between the fourth and fifth metatarsals, and again this compartment was relieved of congestion. Within five minutes after initial incision, the entire foot was pink and warm with a dramatic decrease in the swelling. Further evaluation noted that the rear-foot remained mottled and cyanotic. At that point a fourth incision was made anterior to the Achilles tendon into the deep fascia, and approximately 5 cc of dark blood was evacuated from the calcaneal compartment. The incisions were flushed and packed with saline soaked nu-gauze packing. Attention was then paid to the medial aspect of the calcaneus where a closed reduction of the sustentacular fragment was performed under fluoroscopy. 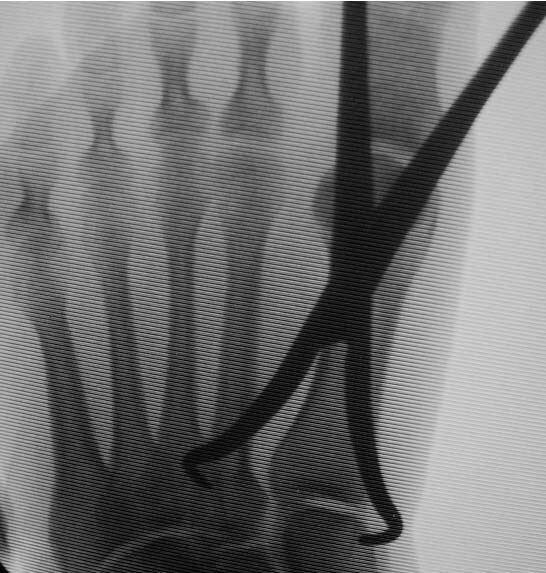 An external fixator device was placed in triangular fashion under fluoroscopy to maintain proper alignment of the destabilized midfoot and forefoot fractures. 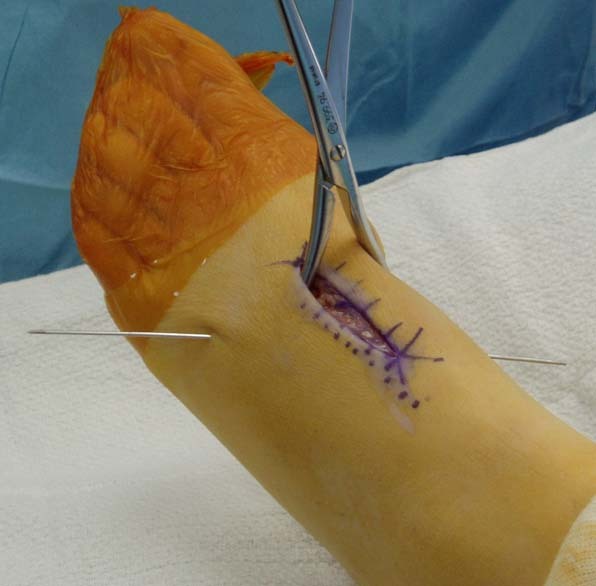 Post-operatively, a posterior splint with a mild compressive dressing was applied and CBC was collected. Medical and hematology consults were activated, neurovascular evaluations were ordered every two hours, cefazolin 1g every 8 hours was started, and repeat radiographs and CT scans were performed. On post-operative day number one (POD #1), hematology recommended transfusions of both platelets and packed red blood cells prior to the surgical procedure scheduled for POD #5. While they recommend the use of SCD’s, compression stockings, and out of bed to chair three times per day, they discouraged the use of heparin or enoxaparin for DVT prophylaxis. Hematology also recommended that in monitoring the patient for active bleeding, the hemoglobin, hematocrit and platelet count should be drawn every 12 hours and to consider desmopression (DDAVP) if the labs worsened. On POD #4, he was transfused with four units of platelets, two units of packed red blood cells, and was given prophylactic diphenhydramine. The patient tolerated the transfusion well with no evidence of reaction. On POD # 5, he was taken back to the operating room for a successful wash out, minor debridement and primary delayed closure. The patient was discharged on POD #6 after two normal CBC evaluations. Figure 5 Patient post reduction with functional left foot and no residual pain or deformity. In the circulating form, platelets appear as a smooth discs enclosed within a plasma membrane. This membrane contains a number of receptor glycoproteins that are responsible for platelet function. Within the platelet are two specific types of granules. From May-Hegglin Anomaly, eMedicine, 2008. 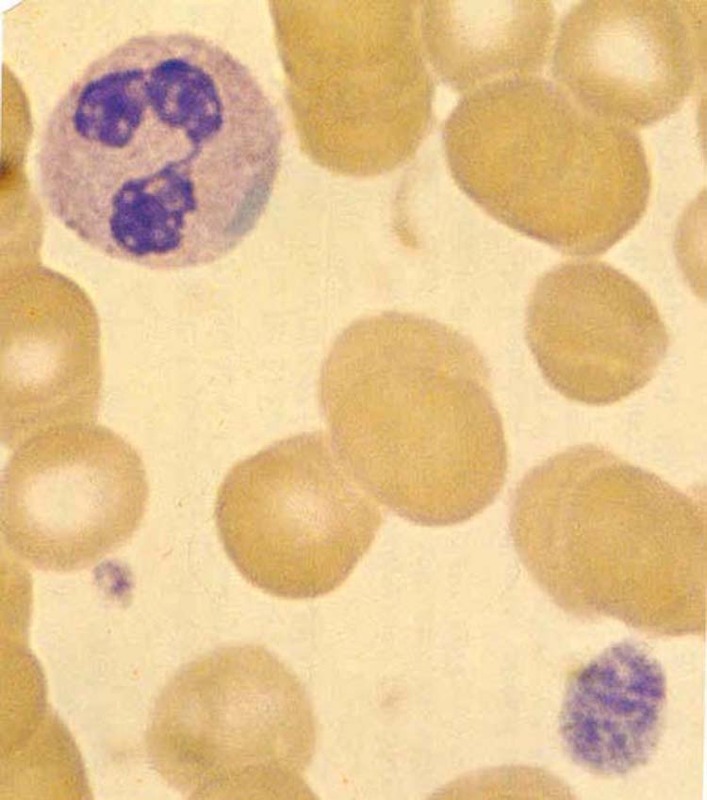 Figure 6 2000x blood smear of a MHA patient demonstrating a typical giant platelet with ill defined granulation. A normal sized platelet is also seen here. The cytoplasmic inclusion body represents a Dohle body. A cell blood count is essential in starting a workup in these patients. The platelet count is decreased, usually between 40,000-80,000mm3. The platelets are enlarged up to 15mm3 in diameter, with normal morphology. Evaluation at the electron microscopy level reveals normal cell organelles with an increased amount of disorganized microtubuli. The Wright-stained peripheral blood smear shows cytoplasmic inclusion bodies, most dominant in the neutrophils, but some are present in the eosinphils, monocytes, and basophils. The inclusions are up to 5µm in size, they are spindle shaped, pale, blue-staining bodies that consist of ribosomes, endoplasmic reticulum, and microfilaments. The inclusions are similar to Döhle bodies and are found in the periphery of the cytoplasm. Bleeding time is typically prolonged in concordance with the degree of thrombocytopenia. Desmopressin stimulates the endothelial release of factor VIII and von Willebrand factor into the plasma (V2 receptor effect). After a slow infusion of 0.3mcg/kg, plasma concentrations of factor VIII and von Willebrand factor is 2-4x greater. Although it can be unpredictable, desmopressin has been shown to shorten bleeding time in a variety of platelet dysfunctional diseases. May-Hegglin is a rare platelet disorder associated with macrothrombocytopenia, leukocyte inclusions, deafness and nephritis. Patients may experience easy bruising, recurrent epistaxis, gingival bleeding, menorrhagia, and excessive bleeding associated with surgical procedures. A patient that presents with MHA and an un-witnessed fall should get a CT scan to rule out intracranial hemorrhage and internal bleeding. Patients that present with MHA should be evaluated by a hematologist to recommend DDAVP and platelet transfusions when necessary. In this case, MHA likely played a compounding role in the rapid development of the foot compartment syndrome encountered and could have certainly compounded the post-operative course. This case demonstrates the need for a multi-disciplinary approach to patients exhibiting May Hegglin anomaly and expeditious surgical intervention when this rare patient population experiences a traumatic event. Additionally, it demonstrates the need to take a thorough history to reveal rare disorders, like this one, in an elective surgery population. A lack of proper treatment in patients with rare platelet disorders can certainly lead to devastating complications. It is our sincere hope that this article will serve to guide the foot and ankle surgeon to appropriately recognize and treat complicating disease processes when they present. 1. Chabane H, Gallais Y, Pathier D, Tchernia G, Gaussem P. Delivery management in a woman with thrombocytopenia of the May-Hegglin anomaly type. Eur J Obstet Gynecol and Reproduction Bio 99:124-25, 2001. 2. Mahdy A.M., Webster N.R. Perioperative systemic haemostatic agents. British J Anaesthesia 93(6):842-58, 2004. 3. Matzdorff AC, White JG, Malzahn K, Greinacher A. Perioperative management of a patient with Fechtner syndrome. Ann Hematol 80:436-439, 2001. 4. Noris P, Spedini P, Belletti S, Magrini U, Balduini C. Thrombocytopenia, giant platelets, and leukocyte inclusion bodies (May-Hegglin anomaly): clinical and laboratory findings. Am J Med 104:355-60, 1998. 5. Sehbai A, Abraham J, Brown V. Perioperative management of a patient with May-Hegglin anomaly requiring craniotomy. Am J Hematol 79:303-08, 2005. 6. Shafer FE. May-Hegglin Anomaly. eMed J [online], 2003. 1Chief, Foot and Ankle Surgery, PA Orthopaedic Center. Adjunct Associate Professor, Dept. of Surgery, TUSPM, Philadelphia, Pa. 19107. 2PGY-4, Foot and Ankle Surgery, Temple University Hospital, Philadelphia, PA, 19140.